Technology is revolutionizing how we do everything and business is one of the many aspects of life that is benefiting from it especially for those who know how to leverage the advantages. Welcome to the best home service business software on the market. Every smart business owner knows that making profits is one of the most essential things in business. You have to keep your profits up and keep your revenue flowing in consistently. This is one of the major challenges business of all kinds face, and those in the home service business are not alien to this either. However, the wise ones are always finding ways to make things better and to stay on top of their game by increasing revenue, many business owners in the home service industry are turning to technology as a solution. This is not just in terms of using more up to date equipment for working, software is the next big thing in turning sales around and bringing in revenue. Whether you are a plumber, a locksmith, an electrician or in any other field of the home service industry, increasing revenue is a top priority and the best home service business software can help you do just that. It is indeed true that many businesses have already adopted various applications and software to manage various aspects of their business, you might still find many of them a drag and several features missing. Many businesses have to combine multiple software to get things done and will still have many parts of their businesses yet to be catered for. What you need is an all in one tool that effectively helps you to automate every aspect of your business and grant you full access and control to all aspects of your business. If you are looking for that perfect software that seamlessly integrates all the details of running a successful revenue generating business, then look no further, FieldSurf is the best home service business software for you. It is America’s cheapest field service management software that has been helping business owners all over the country and beyond to turn their business around and start bringing in more revenue. So how does FieldSurf help your company increase revenue? It’s pretty simple. Every smart business owner knows that the key to making more gains is to do business in the most effective way possible. In a field where everyone is striving hard to hold their ground, being able to deliver your services effectively while spending the least possible time, yet achieving the most effective results, is the key to turning your business around and making your revenue skyrocket. One of the best ways to keep your company’s performance at an impressive level of effectiveness is to coordinate the process of your service delivery and responding to client orders with FieldSurf. A defective system of dispatching and order management makes you lose customers which will resultantly cause revenue to drop. You should prevent errors in receiving orders and reduce errors and delays in dispatching to the minimum level using FieldSurf. This way, the entire process of responding to your client’s call is automated and made easy for your dispatchers to handle. FieldSurf helps your staff coordinate incoming orders and makes dispatching your field technicians to appropriate locations incredibly simple. With this, you cut out down on errors in receiving orders which will leave your customers dissatisfied. You will keep your clients impressed by how fast you are able to respond to their calls so that they leave you positive reviews at every opportunity they get. This is just one of the reasons we are the best home service business software on the market. Organization is the key to making profits. You need to keep your business operations under control, be able to keep a watch over everything, keep a balanced and accurate record, and be able to access vital information if and when you need it. This is an important point to note when looking for the best home service business software that can efficiently increase your home service business revenue. FieldSurf helps you do this effectively. Let’s start with your company’s account. You must admit that getting something out of your accounts department right when you need it isn’t exactly easy business, and it’s understandable. Bookkeeping isn’t really an easy business. But because it is key to keeping revenue up, you need to do it and do it in the most effective way possible. The regular thing many companies do is to record their accounting information manually or in other cases make use of a software like QuickBooks to do it. But this method still leaves you with many days of endless paperwork when it is time to get your financial report. Things change drastically when you use FieldSurf to coordinate your accounting and reporting processes. Your financial report is ready in just a few seconds anytime you need it. No need to wait endlessly for days of exhausting paperwork. We offer QuickBooks integration. If you look at how this method helps you keep a handle on the state of your finance and revenue you will indeed be impressed. FieldSurf analytics tool not only helps you access your company’s financial reporting; you also get to keep tabs on your business’ general performance. You can access sales for specific periods, make comparisons between different periods, find out where most of your orders are coming from and which period of a transaction period is better for business. With information like this at your fingertips, you can be better prepared for coming days, make solid plans and make the best business decisions that guarantee an increase in revenue for your business. Another aspect of your business which you need to keep crisply organized for revenue to stay up is how you manage payments from your clients. The 21st-century business world has a lot of tools that have made payments processing more effective. If you examine your business closely, you will see that one of the ways you have been losing out on revenue is in how your payment system is managed. It is even possible that at one time or the order, you might have forgotten to send an invoice to a customer or encountered delays in retrieving payments due to days of paperwork before invoices are sent out. 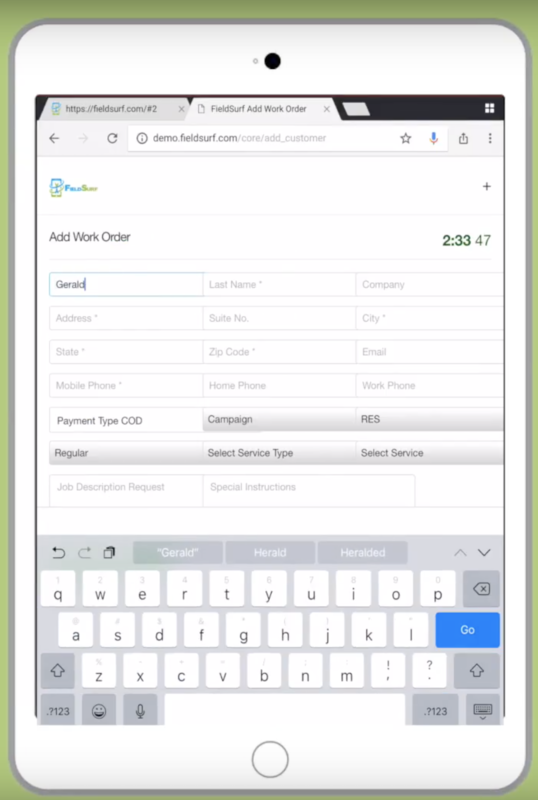 But with FieldSurf, your invoices are prepared immediately you receive an order and sent to your customers electronically. No more time wasting paperwork and no more errors and delay. you can also take advantage of this and make use of On-site payment processing which has a lot of benefits for your business. Other aspects of reporting which this software helps you maintain control over are in managing your inventory and managing payroll for your staff. With FieldSurf you are never in the dark about how much product you have in store and you are always notified before any goods in your stock are exhausted. With this feature, you will never have to turn your customer away because you don’t have an item in stock. You also run into very minimal error if any at all when preparing your staff payroll and you don’t ever have to waste time with it as well. It’s all prepared by an automated system based on how many hours each of your staff has worked and this information is always available on the go. Finally, if it means anything to you, the fact that you are saving some money you would normally spend on buying paper no matter how little it is another way you are boosting revenue. Not to mention how great it is for the environment. When running a home service business, every dollar, and every second counts. Schedule your free demo today to see how we have been helping business like yours throughout the country.